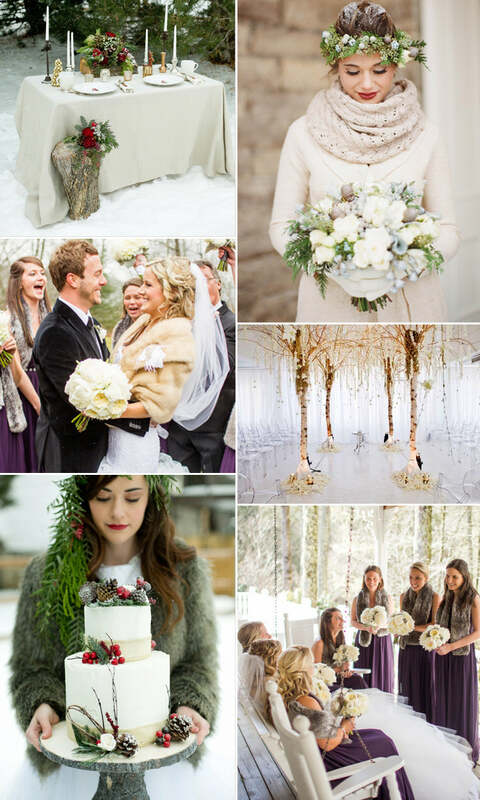 Winter Wonderland or Festive Rustic: What’s Your Wedding Style? The darker nights and frosty mornings are here to stay (well, for the next few months at least) and all around the country winter brides are counting down the hours until their respective big days. December weddings are typically dramatic in their décor, from pure white winter wonderlands to rich and rustic festivities. 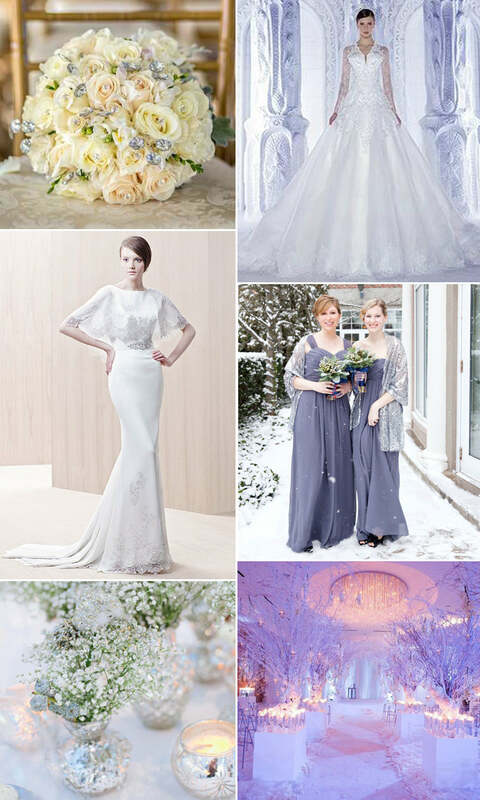 So which winter bride are you? Keep reading as we explore the world of wintery weddings from ice queen ball-gowns to warm nostalgic venue décor. When we think of a winter wonderland dress we imagine a glamourous ice queen in a voluminous dress full of drama. On the other hand this sleek Enzoani design comes with an elegant capelet that’s perfect protection against cool winter breezes. Carry an all-white bouquet and give your bridesmaids winter white posies. To complete the look add icy shades to your makeup with a clean natural base, silver liner in the corner of your eye and pearly shades on your lips and nails. Keep the rest of your make-up neutral. If there’s potential for snow, have your ceremony and reception in one venue to keep travel to a minimum and make sure guests are kept comfortable with hot drinks and warms layers. Fleece or fur wraps are the best options for bridesmaids. Alternatively drape your best ladies in metallic jackets and introduce a little shimmer into your colour scheme. Metallics lend themselves well to the winter wonderland look and can include silver high heels, crystal belts and embellished hair combs or tiaras for your ladies in waiting. To achieve the winter wonderland look the majority of your wedding décor should be white or ivory. The overall effect is classic, simple and beautiful, and you won’t have to match everything to a specific shade. Imagine your venue when it’s transformed with a sea of white flowers, the lights are dimmed and the flicker of candlelight is bouncing off the chandeliers. Sounds perfect doesn’t it? The ultimate winter wonderland can be yours with a little attention to detail. Small touches like church candles and white storm lanterns make all the difference to a winter wedding. For an opulent look incorporate ice and diamonds into your décor with a group of tall silver candelabra draped with sparkling crystals. Pure white orchids or roses lend themselves well to the dramatic winter wonderland theme, whilst stems of crystal gems can be interwoven throughout the bouquet for a luxurious shimmer. For an elegant flower with impact choose a white calla lily, displayed in tall glass vases because of its thick, dramatic stem. Rustic wedding dresses are all about delicate lace sleeves and soft flowing skirts. Embrace country chic in a floaty gown that suits your relaxed informal style. Choose a sleek dress with a small puddle train, elbow length lace sleeves and intricate back detail. When its cold outside the wedding party needs to think about wrapping up. To keep things elegant we think soft fur wraps are the answer both for the bride and her bridesmaids. The flattering neutral cover-ups pictured here are large enough to cover the shoulders and are wearable after the wedding day itself. Some brides give their bridesmaids colourful gloves and scarves to add a touch of humour to their wedding photographs. What could be more rustic than tree branches themselves? Introduce some branches into your venue décor for an ‘outside indoors’ feel. These dramatic birch trees create a natural focal point for the bride and groom to say their vows. Often nostalgic, this theme can include festive greenery and decorations in a warm traditional Christmas palette of red, green and gold. Use holly and red berries as cake decorations or wreaths, wicker hearts and baskets overflowing with pine cones, greenery, candles and roses add to the seasonal rustic feel. In winter there’s a whole range of rich berries and strong greenery like holly and ivy to work with. Single blooms are a simple way to add character to your reception décor. Flowers are grouped together in series of clear or colourful vases to give a handpicked feel. Play around with vases, jugs, buckets and jars and add tea lights to complete the look. Woodland flowers in a simple jar on hessian table runners can be as effective as tall blooms in vases filled with crystals. Whether you’re a minimalist or love lashings of bling, a collection of single blooms can achieve the impact you desire without feeling overdone.